Port 1/8" BSP, NPT or Rc thread. Pressure range 0 to 9 bar, 10 bar maximum, air pilot pressure 3.5 to 7 bar. 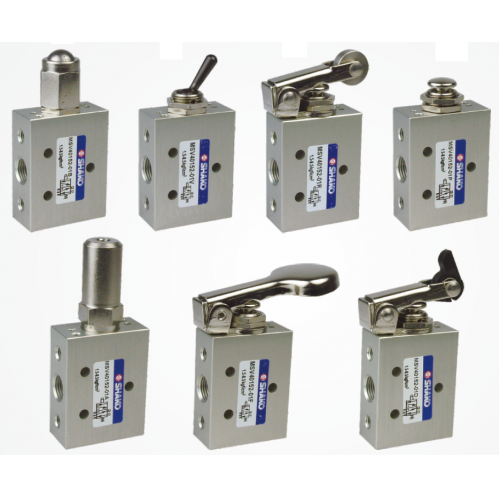 Various operators, toggle lever, roller, push button, one way roller, ball plunger, air pilot or finger button. Temperature range ambient -10C to +60C. Rotary Hand Control Valves 4/2 4/3 WayShako TSV30042(43)-02-03-044/2 or 4/3 hand operated rotary pne..
Hand Control Valves 5/3 way.Shako TSV8753Port 1/4, 3/8" BSP, NPT or Rc thread.TSV8753 5/3 way hand c..
Hand Control Valve 5/2 WayShako TSV8652(R)-01M-02M(S) TSV9652(R)-02M(S) 03MPort sizes 1/8, 1/4 or 3/.. Foot Pedal Valve 3/2 5/2 WayShako FSV8652-02 FSV8632-02FSV8652 5/2 way FSV8632 3/2 way Operation spr..
Hand Control Valve 3/2 WayShako MSV8622-32-42-623/2 way hand control air valvePressure 0~9 bar, 10 b..
Hand Control Valve 3/2 Way Shako MSV9832-02Port sizes 1/4" (option 1/8"), BSP or NPT thread.Pressure..
Hand Control Valve 5/2 WayShako MSV8652-01 025/2 way hand control air control valve.Port sizes 1/8 o.. Mechanical Valve 3/2 way Shako MSV30132-01Port 1/8" BSP or NPT thread.Can be used normally ope.. Mechanical Valve 2/2 & 3/2 way Shako MSV20122-01 + MSV20132-01Port 1/8" BSP, NPT or Rc thr..
Hand Control Valves 3/2 way.Shako TSV9832Port 1/8, 1/4" BSP, NPT or Rc thread.TSV9832 3/2 way ..